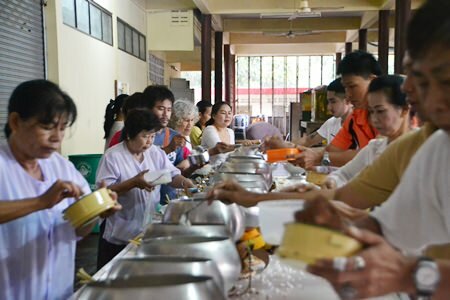 Buddhists from Sattahip to Pattaya celebrated the end of three months of lent and welcomed the traditional end of rainy season with offerings of homemade sweets. Auk Phansa, the end of Buddhist Lent, and the Tak Bat Devo ceremony the following day are the two-day observance of the end of the “rains retreat,” where, in olden times, monks remained within temple walls to avoid trampling rice crops and studied dharma by candlelight. Things have progressed since the tradition began, but its roots remain pure in spirit. 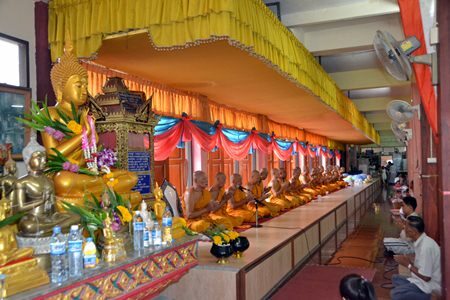 Buddhists welcome the monks back to society with presentations of meats and desserts. Over 20 monks from Bunsamphan temple wish luck upon the citizens attending the merit making ceremony at the end of Buddhist Lent. Pattaya residents eagerly prepared food, sweets, fruits and incense to present to monks at 41 temples around the city while believers in Sattahip participated in re-enactments of Lord Buddha’s return to earth from heaven. Bunsamphan Temple Abbot Visuthipiyakorn said fewer people attended the end-of-Lent ceremonies this year, particularly the Tak Bat Devo ceremony, due to the sluggish economy. 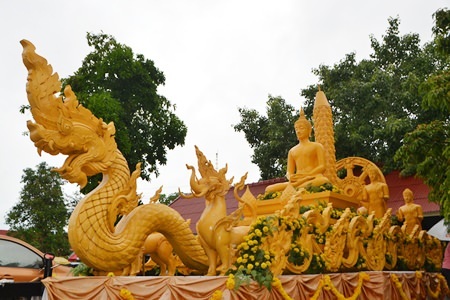 A beautifully crafted candle is still on display at Bunsamphan temple, Soi Khao Noi. Those who did attend offered alms, listened to sermons, studied dharma and received blessings in hopes of gaining increased prosperity for them and their families. The end of Buddhist Lent is always a big affair in hilly Sattahip District. 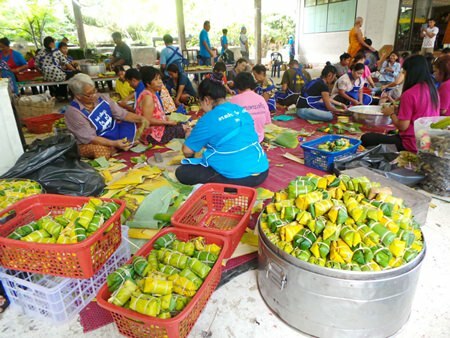 Plutaluang residents spent two days and nights cooking up 100,000 pieces of kow tom mud, a sweet treat of sticky rice, banana, black bean, and sugar wrapped in banana leaves. They brought the food to Khao Baisri Temple for the annual re-enactment of Buddha’s return, carried out this year by 7 monks and 21 novices, who walked down the mountain to receive alms. 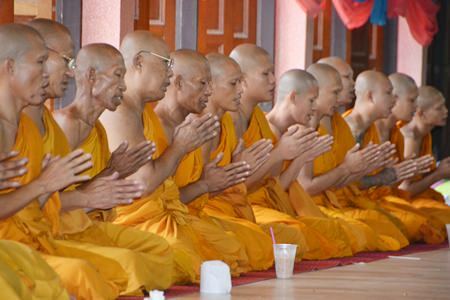 Monks at Bunsamphan temple, Soi Khao Noi chant to announce the end of Buddhist Lent. Khao tom mud has become the common substitute for the traditional, but more expensive, kow tom luk yoni, or sticky rice with coconut leaves. Legend holds that the coconut leaves, which are heavier, allowed followers who couldn’t get close to Buddha upon his return to throw their offerings accurately into his bowl. Tak Bat Devo, derived from the Sanskrit word “Devorohana,” is celebrated at the same time as Auk Phansa, the end of Buddhist Lent. Almost always centered around a temple on a hillside, monks who’ve been in their “rains retreat” for three months emerged in a procession of golden gowns down the hill depicting the path Buddha took down a “celestial stairway” made of silver, gold and crystal. At Sattahip’s Khao Bampenboon Temple, monks carry a statue of Lord Buddha down the mountain on a flower-covered walkway where people could worship. According to ancient tales, Buddha returned to his home in Kapilavastu seven years after achieving Nirvana and becoming the “Enlightened One.” At the start of Lent that year, in remembrance of his mother, Buddha ascended to the heavens to deliver a sermon to his mother. There he resided for three months. On the first day of the waxing moon of the eleventh lunar month – Oct. 9 this year – Buddha returned to throngs of angels, disciples and followers who received him with offerings of food and other sacred items. 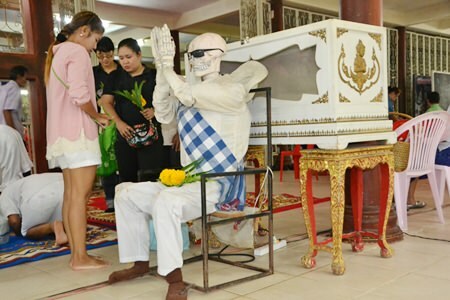 Followers repeated his return in following years during a ceremony that has come to represent the Buddhist belief in reincarnation as much as its historical significance. The Theerarak family makes merit at Wat Chong Lom in Naklua. 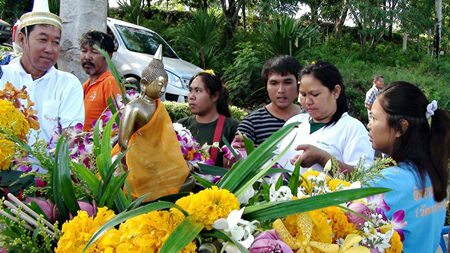 A similar procession was carried out at Sattahip’s Khao Bampenboon Temple, where monks carried a statue of Lord Buddha down the mountain on a flower-covered walkway where people could worship. In Chonburi’s Ban Bung district, about 500 people turned out for the Tak Bat Devo ceremony led by Mayor Surasit Kangwolkij, council members and government workers. Hundreds of monks received food from the locals who set up tables for food in anticipation of the monks. They presented rice, dried food and fruit to make merit and bring about prosperity for their families. Deputy Mayor Verawat Khakhay and his family make merit at Wat Chong Lom in Naklua. A coffin is set up as donation box to help send off the diseased without relatives. Plutaluang residents spent two days and nights cooking up 100,000 pieces of kow tom mud.